Inspiration can come from the strangest places, just ask the brewers of Matilda Bay Brewing Company. As the beer boffins tried to name their incredibly hard to make but very easy to drink cloudy ale, they scratched their head and they scratched their hot and itchy green work pants (an occupational hazard of the job) and inspiration finally struck. From that point on, the brand new Matilda Bay ale was to be called (insert heralding trumpet here)… I.G.P. (Itchy Green Pants). I.G.P. is the beer the Matilda Bay brewers have always wanted to brew so it’s only fitting that the name be a hat tip to the hot, sweaty work they put in day in and day out brewing great beer. As if I.G.P. isn’t already awesome enough, it’s also the first beer to come out of our still-shiny-because-it’s-so-new Port Melbourne Brewery. To start with, I.G.P. will be available in draught only in a bunch of equally awesome venues until the brewers stop itching and actually bottle it. Head brewer Scott Vincent put down his pint of I.G.P. long enough to say, “Some might say that brewing beer is the ultimate dream job, but no-one ever talks about I.G.P. syndrome that’s a result of the hot, hard conditions we endure brewing. Being such a refreshing ale means I.G.P. can be enjoyed by anyone, anywhere and matched with anything, but the Matilda Bay brewers will all tell you that they can’t think of a better partner for I.G.P. than gourmet lamb sausages and kangaroo steaks on the BBQ. From the 2,000 square metre Port Melbourne Brewery that now serves as home base for Matilda Bay also comes Matilda Bay Brewery Company’s other beers and cider as well as all their crazy ideas for new brews. To become a fan of Matilda Bay visit www.facebook.com and search for Matilda Bay Brewing Company or follow Matilda Bay on Twitter @MatildaBayBeer. 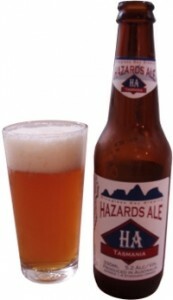 I.G.P will be available on tap at selected bars and pubs around the country from February, 2012. Keep your eye on Facebook and Twitter to find out where the first I.G.P. taps will be available. 4.7% ABV. Pours copper in colour with a short lived head around 2 -3 centimetres in height and average amount of carbonation. Although the level of carbonation didn’t seem to last very long and it had all but vanished by the time i had finished the beer, although the lack of bubbles near the end seemed to have minimal effect on the taste. The aroma was pretty restrained consisting mostly of toasted grain notes although a slight nuttiness and a touch of chocolate was also detected. On the palate this beer exhibits a mildly creamy mouth feel accompanied by sweet toasted malt oriented flavours, butterscotch, caramel, brown sugar a touch of coffee, hazelnut and pepper. The after taste was slightly sweet with a mild butterscotch sweet tang. Verdict: When this brew first came out i was intrigued about what flavours wattle seed could lend to a beer, brought a bottle and can’t remember being overly impressed. Seems my memory didn’t do it justice though and i found this bottle easy drinking with plenty more flavour than i remembered. Where to buy: Pretty much any bottle shop around Sydney that has room to more than the default New, VB combo. Its been awhile since i have had this brew on tap and it was the first time i have tried it in a bottle. It poured clear, golden in colour, with a medium level of carbonation and a head around 2 fingers in size which slowly receded to a thin lace cover. The aroma was mostly malt driven, with sweet caramel notes and the odd hint of basil and lemon. On the palate sweet malty flavours lead the way with caramel, toffee and butter scotch although it’s not too much work to notice hints of citrus and vanilla lurking in the background. The beer finishes crisp with a slightly sweet after taste. Verdict: Easy drinking English style Ale, if your in Sydney there is no excuse to miss tasting it at its birthplace up in The Rocks at the Lord Nelson. Where to buy: This beer is pretty easy to find around Sydney, you can get it from the Lord Nelson Hotel itself, The Australian Hotel or the Australian Wine Centre in Circular Quay. 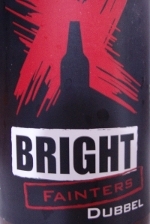 After tasting tasting the Bright Staircase Porter i was very impressed with the effort from Bright Brewery and keen for more so i promptly rushed out and brought a bottle of their Fainters Dubbel to try. 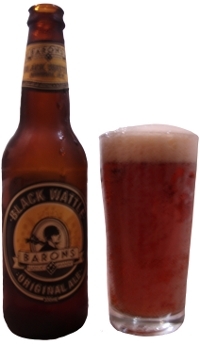 Pouring the bottle into a glass revealed a slightly hazy dark ruby colour beer with a head around 2 – 3 cm high. This subsided rather quickly to a lacing around half a cm thick. On the nose i was blown away by this beer the smell was packed with the odour of raisins which instantly made me think of port wine. 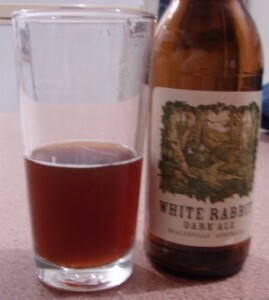 On the palate this beer had a nice creamy body with the flavour mostly dominated by raisins, plum and hints of spice. The taste finished pretty dry, with a noticeable warmth provided from the alcohol content. Verdict: Very unique in flavour and at 8.5%, it packs quite a punch, definitely a beer for sipping. It’s not something i would like to drink everyday but it made a pleasant deviation from the norm. Mountain Goat is a relatively new Victorian brewery but they seem very capable when it comes to brewing a great tasting beer and this is earning them a legion of fans around the country. Their Surefoot Stout doesn’t seem to deviate any from the high standards set by their their other beers either. 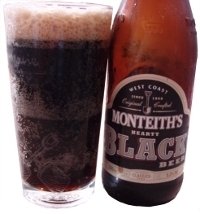 In a glass it exhibits a medium sized tan head over a very dark almost black lightly carbonated body. Which aroma wise dominated by cocoa notes. To taste the flavor is mostly made up of toasted malt flavours accompanied by rich cocoa and coffee hints which leave a faint nutty quality in the aftertaste. Verdict: I found this beer to be highly enjoyable and satisfying, perfect for unwinding at home after work on a cold winters night.